I used to think that the phrase “Are we there yet?” was a cliché joke. And a new horror began. Here’s the thing. We live at least 6 hours from the nearest set of grandparents (and 13 from the other). This is a lot of time cooped up in a vehicle together. Do you remember what the mother of invention is? This article is a summary of the road trip games that my family has created and played over the years. They have managed to keep my kids content and happy for MOST of those hours stuck in the car. In fact, we usually don’t hear that dreaded phrase until the very end of our journey, thank God. I’d like you to think of this as an Emergency Survival Kit for the long family road trip. 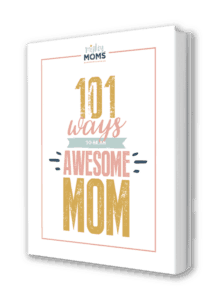 No, friend, those are NOT going to be in this article because you don’t come to MightyMoms.club to read old-hashed-out boring tips and suggestions. You come to MightyMoms.club because you know you’re going to read something entertaining and unique! I’d hate to let you down, so we’re going start right out the bat with the Taylor family’s favorite family road trip game: Zit. Yes. It’s a game called Zit. And you don’t have to be a puberty-enthralled teenager to play it. Basically, you’re searching the countryside for items that are on the point list. Since you’re moving, the scenery is always changing, which creates new opportunities to win and play. This tends to quiet the car down, since everyone is intent on picking out a motorcycle or white horse first. Step Two: Review the rules either using this free handout or by reading below. Chose someone to be the scorekeeper. Step Three: Decide on the winner’s reward. Extra hugs, first to pick the next movie, choose where you stop for dinner, etc. I don’t recommend exclusion rewards like “The winners get ice cream cones.” That will immediately make the game too serious and lead to fights. Remember, you can’t send them to their rooms, so choose a reward that ends up blessing everyone. Step Four: Search the countryside for the following items. When you spot them, you MUST shout, “Zit ________ (motorcycle, blue silo, white horse, etc. )!” and point at the item. Whoever yells that first, gets the point. Feel free to add your own items, just make sure they aren’t too common. For example, when I was growing up *cough* we counted satellite dishes as a point. Nowadays, though, those are EVERYWHERE, so we’ve kicked them off the list. Sunny was created by the Taylor kids one summer when we were driving through several big cities on vacation. It’s almost identical to Zit, only adapted for an urban environment. Follow the Steps One – Three above. Step Four: Search through parking lots, oncoming cars, anywhere a vehicle might hide and shout out the “name” of the car. Whoever names it first gets the points! You can also double up on points, so a Sunny Oldie would be 11 points. Money (Limo) = steals the other team’s points, and gives them to your team instead. Copper (Police vehicle) = removes the other team’s points, putting them at zero. Next to Zit, this was my second favorite family road trip game. It’s best played off the interstate, on country roads. Step One: Choose whether you’ll be using the houses on the right side of the car, or the left. Step Two: Choose who is going to get the first house, and then rotate people and houses naming “Your House, My House,” etc. etc. The kids LOVE this game, because it’s exciting to discover whether you’re going to “get” the house that’s all nice and pretty, or the dump with the dishwasher in the front yard. Step One: Be driving on a country road, near farmland. Step Two: Safely, slow down. One player leans out the window and screams “MOOOOOOOOOO!!!! !” as loud and long as you possibly can, then counts the number of cows who look up, puzzled at your dialect. Step Three: The other player takes their turn at the next farm. Step Four: Compare the number of confused bovines. The winner is the one who got the biggest response. Yes, this is a ridiculous game, but I’ve yet to meet a kid who didn’t love it so much that I was forced to attempt to distract them away from cow-farms by pointing excitedly at nothing through the car window on the other side. True story: My Dad once excitedly told us to watch for baby bears on the side of the road, because he SWORE he just saw one. Slips of paper with a random squiggly line printed on each one. Our task was to use that line to fit into a picture of some kind. Magical invisible ink sets. Today you can find these Color Wonder sets as blank paper, or coloring books like Avengers, Paw Patrol, and Sofia the First. These amazing marker sets won’t mark on the car seats! Of course, don’t forget to pack a bag of toys, extra crayons, and the boring backup plans: books, movies, music, and audiobooks! My friend Christi swears by this toddler travel tray, which gives your car-seat-strapped child a flat surface to play on. I know it can be a pain in the royal derriere to travel with children. The endless potty breaks…the inevitable arguments…the whining…but there is some really good moments tucked in there as well. Those road trips are more than just moving from Point A to Point B. They are precious cracks in a very busy family’s life. Cracks that you can fill with at least a few good happy memories. Seatbelts secured? Snacks stashed? Printable printed? Off to the wide blue horizon!